Le yokozuna Hakuho ne s’est pas laissé impressionner par l’attaque de Ura et rapidement a su s’imposer pour préserver son score parfait. 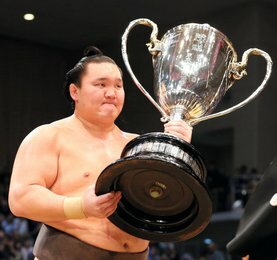 Le yokozuna Hakuho s’est rapproché encore un peu plus du record de victoires de Chiyonofuji dimanche en améliorant son score à 8-0. Hakuho, qui a remporté le grand tournoi de mai avec un record parfait de 15-0, est toujours invaincu depuis 23 matchs consécutifs depuis qu’il s’est retiré pour soigner sa blessure en mars. En remportant le 1044e combat de sa carrière, il n’est plus qu’à une victoire de Chiyonofuji (1045). Mais la victoire de Hakuho a exigé de lui qu’il surmonte une attaque peu orthodoxe du maegashira 4 Ura (5-3). Ura a chargé très bas en bas tout en essayant de saisir les jambes du yokozuna. Hakuho ne s’est pas laissé avoir et a riposté en chargeant à son tour son adversaire. Après que le second essai d’Ura ai échoué, Hakuho a conduit le jeune homme de 25 ans au bord de l’anneau et l’a renversé. Seul lutteur invaincu du tournoi, Hakuho conserve sa place de leader. Il est suivi de près par le maegashira 8 Aoiyama et le nouvel ôzeki Takayasu qui sont à 7-1. 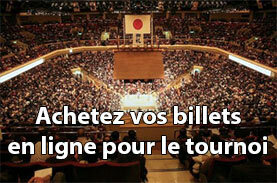 Takayasu a remporté son septième match consécutif de manière absolue, conduisant Chiyoshoma vers sa cinquième défaite. L’ôzeki a utilisé sa plus longue portée pour empêcher le maegashira Mongol d’accéder à sa ceinture. Le parcours idéal d’Aoiyama s’est arrêté aujourd’hui quand il est tombé entre les mains d’Onosho. A seulement 21 ans, ce dernier a pris le dessus sur le Bulgare infligeant à Aoiyama sa première défaite du tournoi. Le yokozuna Harumafuji est toujours en retrait sur les leaders avec un score de 6-2. Le yokozuna n’a pas ménagé ses efforts pour vaincre Kagayaki (3-5). L’ancien ôzeki Kotoshogiku (3-5) a obtenu une nouvelle victoire en battant le komusubi Yoshikaze (4-4) en labourant son adversaire à grands coups d’élans jusqu’à réussir à l’expulser du dohyô. L’ôzeki Goeido (5-3) a utilisé la méthode expéditive contre le maegashira 2 Hokutofuji (4-4) au moment de la charge pour forcer son adversaire à sortir de l’anneau. Bonne nouvelle pour Takanoiwa (1-7) qui est parvenu à remporter son premier combat du championnat en battant Okinoumi (3-5) par uwatedashinage. Yokozuna Hakuho moved one away from the career win mark of the late yokozuna Chiyonofuji on Sunday, when he improved to 8-0 at the Nagoya Grand Sumo Tournament. Hakuho, who won May’s grand tournament with a perfect 15-0 record, is unbeaten in 23 straight matches since he withdrew injured in March. By winning his 1,044th career bout he moved one shy of Chiyonofuji, whose 1,045 are second on the all-time list. 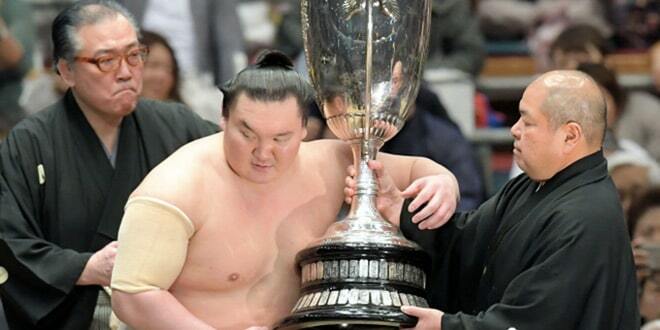 But the victory required Hakuho overcome an unorthodox attack from No. 4 maegashira Ura (5-3). 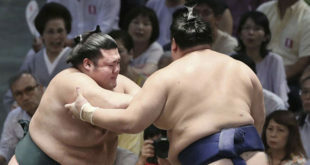 The victory lifted the yokozuna into the sole lead as the tournament passed the half-way mark at Aichi Prefectural Gymnasium. Ura darted in low, trying to wrap up the yokozuna’s legs. But while the tactic threw Hakuho off his rhythm for a moment, it did not topple him and the Mongolian master was able to take charge of the bout. After Ura’s second try failed, Hakuho yanked the 25-year-old to the edge of the ring and toppled him with a beltless arm throw. Hakuho, now three wins shy of Kaio’s record of 1,047 victories, started the day tied for the lead with No. 8 maegashira Aoiyama. But the Bulgarian bruiser suffered his first defeat to fall into a two-way tie for second with ozeki Takayasu. 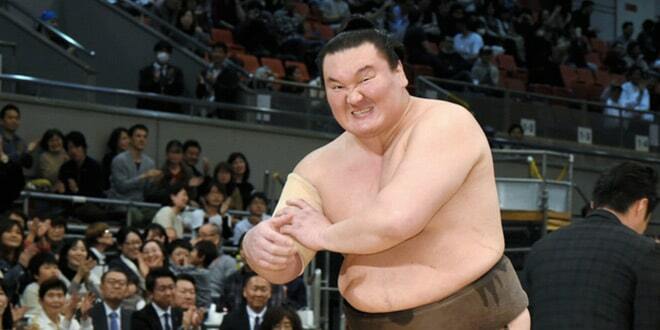 Takayasu won his seventh straight bout in no-nonsense fashion, forcing No. 5 Chiyoshoma out to his fifth defeat. The new ozeki used his longer reach to keep the Mongolian maegashira from exploiting his belt hold while twisting him back to the straw and out. Aoiyama’s perfect start came to a halt at the hands of impressive 21-year-old Onosho (6-2). The youngster was forced back a step as the bout opened but soon had his chance. The huge Aoiyama missed with a haymaker slap on his opening charge and Onosho seized on that instant of vulnerability to ram into his much-larger opponent’s chest. Before the 195-kilogram Aoiyama could blink, he was being propelled backward by the 155-kg Onosho and out of the ring to his first loss. Yokozuna Harumafuji was among the wrestlers a win further back at 6-2 after he overcame a spirited effort against No. 4 maegashira Kagayaki (3-5), who will face Hakuho on Monday. In other matches, former ozeki Kotoshogiku (3-5) surrendered belt holds to fellow komusubi Yoshikaze (4-4) but continued to plow forward and used his momentum to seize control and crush his opponent backward over the straw. Ozeki Goeido wrapped up No. 2 maegashira Hokutofuji on his charge and plowed him out with little difficulty to improve to 5-3.